Visitors journeyed through four aspects of Thai food culture under the theme ‘Nourishing and Delighting the World'. 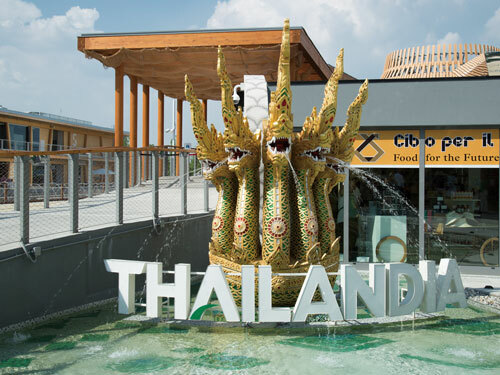 These themed areas aimed to reflect Thailand’s response to the issue of world hunger and to highlight the country’s efforts to develop sustainable food production, while offering patrons a chance to sample authentic Thai cuisine at a floating street market. Another area of the pavilion (which was shaped like a traditional farmer’s hat) detailed food cultivation practices in Thailand. Panasonic 1-Chip DLP™ PT-DZ870 unites – chosen of their outstanding brightness, reliability and features for multi-projector applications – were configured to create a colour-drenched 360-degree panorama. These were joined by a further two PT-DZ970s projecting seamlessly edge-blending large-format video images onto a curved screen in a theatre room. Eight 3-Chip DLP™ PT-DZ21K projectors, meanwhile, where mounted vertically to throw an ever changing montage of images onto the floor.